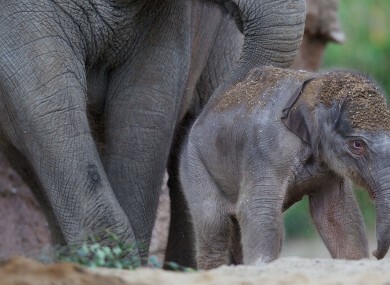 DUBLIN ZOO’S ASIAN elephant herd is welcoming a new member today. The female calf was born on Monday night after a 22-month pregnancy for her mam, Asha. She is estimated to be just under a metre tall and weighs around 70kg. The new arrival is Asha’s first calf and the fourth elephant calf born at Dublin Zoo in two years. The new arrival will join the herd of eight Asian elephants, including dad Upali, in the Kaziranga Forest Trail. Gerry Creighton, Operations Manager at Dublin Zoo said the birth marks a major milestone for the zoo. “We are delighted with the new arrival and happy to report that both mum and calf are doing very well. This is Asha’s first calf and so far she has done a remarkable job. Asha has incredible maternal instincts and over the past two years has watched the other females in the herd raise their calves and learned from their behaviour. “This is a very special birth for the animal care team and a historic day for Dublin Zoo. Mum Asha was the first Asian elephant born in Dublin Zoo back in 2007 and today we are celebrating her first calf. Dublin Zoo is inviting the public to suggest a name for the newest arrival based on her Asian origin. Email “It took a 22-month pregnancy but Dublin Zoo has a new elephant calf”. Feedback on “It took a 22-month pregnancy but Dublin Zoo has a new elephant calf”.